An entrepreneurial society refers to places where knowledge-based entrepreneurship has emerged as a driving force for economic growth, employment creation and competitiveness. In this context, entrepreneurial universities play an important role as both knowledge-producer and a disseminating institution. In the literature, several studies contributed with relevant findings. Most of these studies reveal a tendency to use case studies to explain this phenomenon justified by the embryonic nature of the topic field, and with the lack of a robust theoretical framework to understand it. No empirical study, however, has highlighted the interrelations among environmental and internal factors that conditioned the development of entrepreneurial universities with the teaching, research and entrepreneurial missions that they need to achieve. This paper aims to contribute to a better understanding of these interrelations identifying the most critical factors that conditioned these missions and to this end brings a proposal model to measure this phenomenon empirically in the light of the Institutional Economics and the Resource-Based View. The methodology adopted is integrated by the Spanish Entrepreneurial University Scoreboard to identify this phenomenon and Structural Equation Modeling to analyze the relationships among independent and dependent variables that integrate the proposal model of entrepreneurial university. This research could cover invaluable strategies to bring further benefits to society (in terms of the creation of new business and employment) and, in particular, to educational institutions. 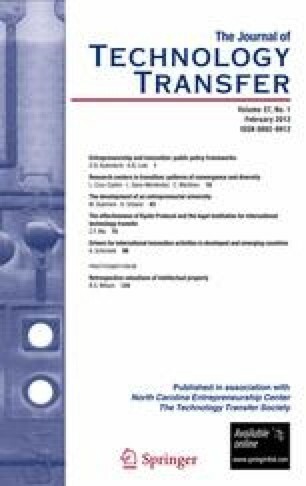 A previous version of this paper was presented at the 2009 Technology Transfer Society Annual Conference (Greensboro, North Carolina, October, 2). We are most grateful to several participants for their comments and suggestions, which have contributed to the improvement of this study. In particular, we highly appreciate comments from Professor Albert N. Link and Professor Sarfraz Mian. We are also grateful to comments and suggestions by two anonymous reviewers, which have decisively contributed to improve this final version of the manuscript. Finally, Maribel Guerrero has received financial support from the Autonomous University of Tamaulipas (Mexico). David Urbano has received financial resources from SEJ2007-60995 (Spanish Ministry of Education and Science) and 2005SGR00858 (Catalan Government’s Department for Universities, Research and Information Society). Enterprises founded by MIT graduates. European Commission. (2005). European innovation scoreboard 2005. http://www.trendchart.org/scoreboards/scoreboard2005/index.cfm. Accessed 25 June 2006. European Commission. (2008). European innovation scoreboard 2007. http://www.proinno-europe.eu/index.cfm?fuseaction=page.display&topicID=275&parentID=51#. Accessed 25 September 2008. Ewalt, D. M. (2004). America’s most entrepreneurial campuses: Methodology. New York: Forbes. http://www.forbes.com/lists/2004/10/21/cx_de_1021_04conncampentrepremeth.html. Accessed 28 June 2006. INE. (2008). Estadística de la enseñanza universitaria en España. Curso 2006–2007. Instituto Nacional de Estadística de España. http://www.ine.es/jaxi/menu.do?type=pcaxis&path=/t13/p405&file=inebase. Accessed 28 September 2008. Institute for Higher Education Policy. (2006). Berlin principles on ranking of higher education institutions. UNESCO. http://www.ihep.org/Publications/publications-detail.cfm?id=3. Accessed 28 September 2007. IPYME. (2006). Iniciativas Emprendedoras en la universidad Española. Dirección General de Política de la Pequeña y Mediana Empresa. Ministerio de Industria, Turismo y Comercio, Spain. http://www.ipyme.org/IPYME/es-ES/IniciativaEmprendedora/Promocion/AmbitoEducativo/. Accessed 27 September 2008. UNIVERSIA. (2006). Empresas de base tecnológica en las universidades. http://investigacion.universia.es/spin-off/empresas/unis/index.htm. Accessed 28 September 2008. Webometrics. (2005). Methodology of ranking: Web de las Universidades en el Mundo. http://www.webometrics.info/methodology_es.html. Accessed 28 September 2008.